International Space Station Expedition 53 astronauts Randy Bresnik and Joe Acaba stepped outside for the third spacewalk this month dedicated toward outpost maintenance activities. U.S. Extravehicular activity (EVA) 46 lasted 6 hours, 49 minutes. It started at 7:47 a.m. EDT (11:47 GMT) October 20, 2017, once the NASA duo switched their spacesuits to battery power. Bresnik was the lead spacewalker and wore the suit with red strips, while Acaba wore the suit with no stripes. Their primary task was to replace a camera light assembly on the recently replaced Latching End Effector on the robotic Canadarm2 and install a high-definition camera on the starboard truss, among various other tasks. Originally, a camera on the Destiny laboratory module was supposed to be replaced during this outing. However, after it was found the camera attached to the recently installed end effector on the robotic arm was out of focus, mission managers decided to make its replacement a priority. The astronauts worked at breakneck speed and wrapped up the primary tasks relatively quickly. They then moved on to complete several “get ahead” tasks. These included having Acaba finish greasing the end effector that was installed during the first EVA this month. Additionally, according to NASA, Bresnik prepared one of two spare pump modules and separate stowage platforms to enable easier access for potential robotic replacement in the future. This was nearly finished, but further work will ultimately be completed during a future spacewalk. This was the 10th EVA of 2017, one of which being a Russian segment-based spacewalk. The previous two occurred on October 5 and 10. 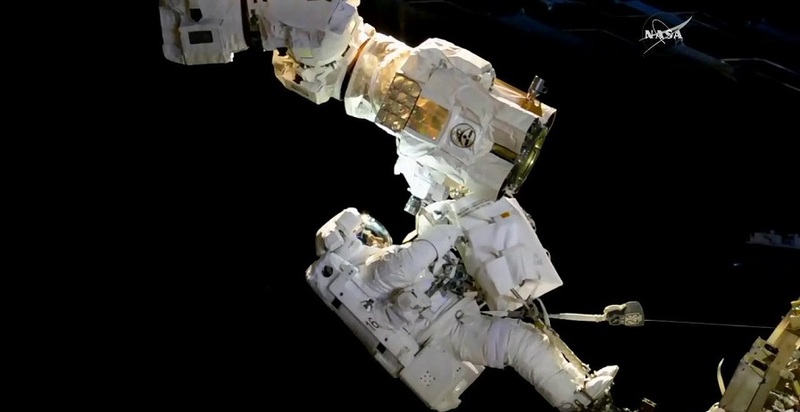 While the spacewalk went relatively smoothly, there was one hiccup. When Acaba was working on greasing the four latches on the end effector, mission controllers noticed the controller for the Simplified Aid for EVA Rescue (SAFER) was not in its slot. SAFER is designed to be used in the event an astronaut becomes untethered from the outpost. It is similar to the Manned Maneuvering Unit that was used in the 1980s but smaller and lighter with limited amounts of fuel. When Bresnik made his way over to Acaba’s location, he noticed the controller was on with an indication that the 3.1 pounds (1.4 kilograms) of nitrogen in the jetpack was depleted. Acaba was directed to finish his work at Canadarm2, but then he had to make his way back to the airlock while being extra certain that his tethers were functioning properly. Once Bresnik finished his tasks, he too made his way to the airlock. EVA-46 officially wrapped up at 2:36 p.m. EDT (18:36 GMT). This was the 205th EVA in support of ISS assembly and maintenance since 1998. Bresnik completed his fifth spacewalk bringing career time walking in space to 32 hours. Acaba was on his third excursion into the void for a total of 19 hours, 46 minutes. The next major activity for the outpost will come on November 11, 2017, when Orbital ATK will launch the OA-8 Cygnus spacecraft, named S.S. Gene Cernan, to resupply the ISS. The next round of spacewalks is expected to happen in January 2018. It will also be a three-EVA series and will involve replacing the other end effector “hand” of the robotic arm.